The revelation that Michelle Obama conceived her daughters with the aid of in vitro fertilization helped make her memoir Becoming the best-selling book of 2018. Saturday, in a sit-down with Oprah Winfrey, actress and author Gabrielle Union and her husband, NBA star Dwyane Wade, will detail Union’s challenges with infertility, their use of a surrogate and how the internet reacted to photos of Union with their baby daughter, Kaavia James. With these two widely recognizable women, modern black motherhood is having a moment — actually, it’s having a bunch of moments, doing all kinds of representation work. Obama, Union, Cardi B and the late Kim Porter, whose recent death has people reassessing her public life and motherhood, are among the latest additions to the canon, following Beyoncé and Serena Williams, whose pregnancies became public discussions last year. Their stories lend sympathetic faces to reproductive issues, such as infertility and surrogacy, that have long been coded as white. Or in the case of Cardi B, who called off a fall tour with Bruno Mars because “I underestimated this whole mommy thing,” balancing the joys and demands of new motherhood with the joys and demands of superstardom. Together they have broadened and extended visions of black motherhood, like various arms of Kali, the multilimbed Hindu goddess of life, death and creation. Their stories of race and reproduction have brought attention to aspects of black motherhood that have historically been hidden, disbelieved or one-dimensionalized. For instance, it was clear from Obama’s promotional interview with Robin Roberts, in which she talked about her daughters’ conception and said she’d carried the grief of a miscarriage, that she had a lot more to say about motherhood beyond what it was like to be “Mom-in-Chief.” To quote Cardi B, she revealed what it means to be a “regular, degular, shmegular” black mother, even as she acknowledged the exceptionalism of her own life as first lady. Our ideas about what it means to be a mother are heavily influenced by the imagery that surrounds us. The impressionist Mary Cassatt, for instance, captured a specific vision of late 19th-century American motherhood. Her paintings are full of mothers gazing lovingly at their well-fed and cared-for children. Black women were nowhere to be found in these journeys into parental romanticism, not even in the background as mammies or wet nurses. Born in 1844, Cassatt was part of the early feminist, “New Woman” movement. But she created an idealized fiction of femininity, one in which the banal, everyday miseries of the job of mothering were nonexistent. It was white mama propaganda. The complications of class, hunger and poverty would show up later, in 1936, thanks to Dorothea Lange, whose Migrant Mother photo telegraphed the dire conditions of the Great Depression to an entire country. The public presence of real-life, three-dimensional black mothers such as Obama, Cardi B, Union, Porter, Beyoncé and Williams serves not just as an addendum to a narrative but also as a corrective. Union’s snapshots of the first days of bonding with a new child who came into the world via surrogate are purposeful, deliberate image-crafting, of course. But they also add to the continuum of discourse of what it means to mother, in the same way that a portrait of a pregnant Williams from 2017 is in conversation with a similar image of Demi Moore from 1991 about what it means to be famous and pregnant. Porter, the late model, actress and businesswoman, blended her performative identity as a hip-hop muse with her practiced co-parenting of four children with Al B. Sure! and Sean Combs before the phrase “co-parenting” became part of the lexicon of mothering and fathering while romantically untethered. With Combs, Porter created her own Modern Family long before it premiered on television. It all represents added complexity and “an uptick in terms of what I would say kind of celebrated black motherhood,” said Treva Lindsey, a professor of women’s gender and sexuality studies at Ohio State University. “I think we’ve had a large American discourse around failed black motherhood.” But of course the 1965 report by Assistant Secretary of Labor Daniel Patrick Moynihan often cited in casting the black family as pathological, Ronald Reagan’s welfare queen and the War on Drugs’ crack mom stories were largely white men talking, and making public policy, among themselves. 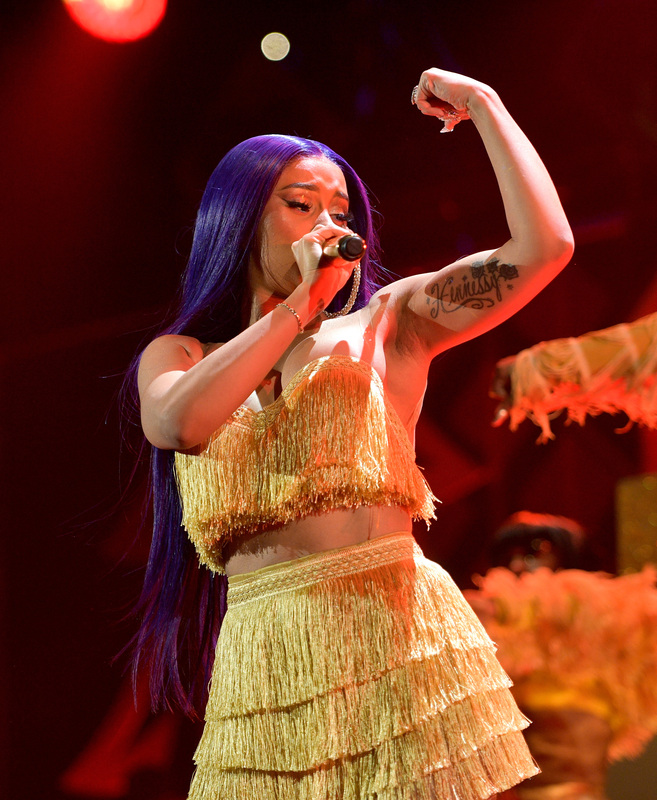 Cardi B performs onstage during 102.7 KIIS FM’s Jingle Ball 2018 Presented by Capital One at The Forum in Inglewood, California, on Nov. 30. In the face of the ceaseless judgment heaped on black women’s bodies, they often chose to remain silent. Black women heard: You’re reckless — eating too much, not eating enough, abusing substances, not going to the doctor. Women “felt they would be shamed, they would be attacked, that they would add to the already burdensome and negative stereotyping of black women” if they talked about their struggles, Lindsey says. And, in a more quotidian calculation, they also reasoned that no one would believe them. It’s only been recently that we’re engaging broader questions about the effects of misogynoir and medical neglect. But unlike the subjects of Cassatt’s paintings, the fire this time features real, live black mothers who happen to be among the most famous women on the planet. By living their lives with a key light trained on them, they illuminate and normalize issues covered by sites such as Mater Mea, a digital publication that focuses on black motherhood. When Obama and Beyoncé spoke openly about experiencing the grief of miscarriage, they helped to dissolve layers of socialized shame. When Williams decided to make her postnatal near-death experience public, first in Vogue and then later in her own HBO docuseries, she provided a recognizable face to connect to studies detailing racial disparities in maternal care and mortality. “Black women are talking about ourselves as mothers,” said Deesha Philyaw, who writes about parenting, race and gender. By doing so, they are “reclaiming that narrative” not just from the white indifference but also from black strictures against putting your business out in the street. With Obama, we’re “seeing someone who we see as a paragon of strength, but also there’s still a grief. For those of us who had these losses, it’s OK to grieve,” said Philyaw. With surrogacy and IVF, “I hear people talking about, ‘Oh, that’s some white people s—.’ I mean, granted, it’s very expensive, but there are all of these very valid, very loving ways to make a family.” And it’s about time black women took their place as the face of many of them. When Cardi B canceled her tour, “it just sort of reminded me of how all-consuming pregnancy, and later motherhood, can be and how that juggling starts early, in terms of whether it’s your career or just time for yourself,” said Philyaw, who has a biological and an adopted daughter. It represented a relatively modern entitlement for a black mother to push back against the forces compelling her to be on her grind, no matter the personal cost.